Today in the age of Internet, we are exposed to many source of information, either from the news portal, magazines or blogs of our choice, or from social sites like Facebook or Twitter. There are so much information created everyday and sometimes it is very difficult to consume them all. Well, maybe you will think that some stories out there are presented in a conventional way and somehow it is boring to read. Well, here I’m going to introduce some fresh ways of creating and consuming information in this digital age. As mentioned in my previous article, fancy scrolling website is one of the hottest trends on the net. When scrolling down, the parallax effects and unexpected object animations give a fresh new definition for scroll down the page where it used to be boring. But for people who are not really good in coding, how are we going to create such cool scrolling and presentational effect website? Well, I gathered a few essential plugins and tutorials found on the Internet that will let and teach you to make such websites with a breeze. Many of these plugins mentioned below are powered by jQuery and they are really powerful. Please continue read to find out all of these great resources. Perhaps you had been to design school, learning web design skills that are actually quite outdated and not practical anymore, and been wondering where is the best place to learn the best practices of web development. Well, in this post I will show you some really useful sites that teach you real web development skills. Personally, I think that the best place to learn about web design or development is going to be on the net. Those dedicated sites, blogs and tutorials are very useful which one might hardly get to learn this in school. Without further explaining, here are the 11 great sites to learn about web development online. As we all knew it, page loading speed is one of the crucial subject to measure the success of a website. As a user, we all love fast loading websites and if a website takes its sweet time loading, most of the people will lose patient and leaving the site. According to John Jersin, Product Manager of Google, he said that 1 second delay in loading time resulting in 7% loss in conversions. These shows that how important to optimize your website and maintaining the loading speed to a satisfactory level. Here I am going to show you some useful tools to test your page speed. Read on to find out! When we talk about online font identifying website, the first website that comes to our mind is WhatTheFont by MyFonts. And recently, there is another new font identifying website called What Font is. With both website we can upload a picture or use image URL to identify a font we don’t know. But how accurate they are? In this article, I would like to compare both WhatTheFont and What Font Is font identification service and to see which one is better and more accurate. To be more precise, I did the test three times and evaluating the usability of the website too. When searching for information on the Internet, normally I will go to search engine sites like Google or Yahoo. However, I also use social bookmark site Del.icio.us as search engine alternative too. Well this is because Del.icio.us has the tagging system that make search result more precise and focused. By searching through Del.icio.us, you might discover many interesting sites that bookmarked by other users which maybe buried deep in Google search result. I also want to suggest (especially Web Designer) that to use Del.icio.us to store bookmarks instead of in your web browser, because you can access to your bookmarks everywhere, and you can save as many as you want too. Plus, you can also check what website/blog article is hot on the popular list. 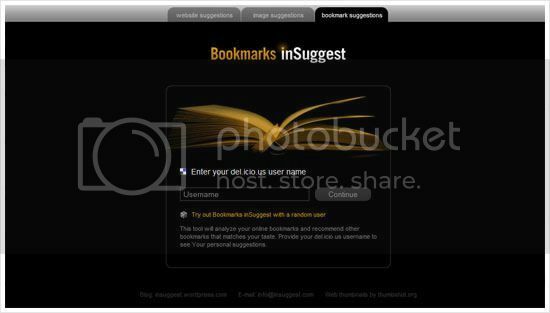 Today I stumbled upon an interesting site Bookmark Insuggest – This tool will analyze your online bookmarks and recommend other bookmarks that matches your taste. Provide your del.icio.us username to see Your personal suggestions. Besides bookmarks, it also suggest websites and images that you might interested in too. Well, pretty slick and cool sites to use. When I found a inspiring websites, normally I will make a screenshot of the site. Until now, I had collected quite a bunch of screenshots and they are scattering inside my hard disk drive. I wanted to share those nice website screenshots with everyone as a gallery in one page but I couldn’t find a way. Fortunately ScrnShots has become the perfect solution. Today, I received an email and it says that ScrnShots had gone public! I was so excited an quickly sign up an account. ScrnShots is like a Flickr dedicated to web screenshots and screen based design. It looks like an alternative to web design galleries because it was uploaded by community, and the screenshots uploaded can be embed into your blog and any other social sites too. Cool. Personally I found ScrnShots is fun to use, and the most important thing is, it’s FREE! I really recommend to web designers to sign up and start sharing great web screenshots. This is my account but I just uploaded a few only. Until now, I’m still embracing the beauty of web 2.0 design: The glossy effect, the badges etc.. But the presentation of “Destroy the Web 2.0 Look” by Elliot Jay Stock has changed my perception and makes me understand even more about what is the real Web 2.0. Elliot presented this topic in FoWD event in New York and for people like me who couldn’t attend the event, there is a slideshow which I embeded below and PDF document for download. He emphasize that “Web 2.0” is not a design aesthetic, and to encourage people to break with overused of the current web design trends. In the presentation there said that the characteristics of Web 2.0 that coined by Mr. Tim O’Reilly does not touch anything about design at all! So, don’t blindly use the style but use it with rational, and come out with own concept and design. Don’t follow the cliche and pursue something new! Today, I will give out the my latest vector collection which is 7 different styles of badges vector, all free for download! 😀 As you can see, the 7 badges each I created is unique shapes and styles, read more to take a clearer view of 7 of it. To make the series special, I put some effort on the last badge. I used some Japanese pattern and sunshine to design it, the result is not bad right? The most important thing is the shape of the badges, the graphics inside are the possibilities of designs, you can always change it to make it yours. This time I provide EPS format for download, I think EPS is more convenient right? Many vector softwares can read EPS, but I recommend to use Illustrator CS2.